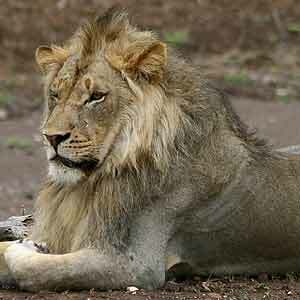 Lions (Panthera leo) are members of the true cat family (Felidae). They are also the only true social cats, living in prides that are based on a matriarchal social structure with females forming close, usually life-long bonds. Lion prides can comprise from around four to 40 members, of which more than half will be cubs or young adults, but the average size is about 15 lions. The pride usually consists of a few generations of related females, together with their cubs and one or more adults males who can defend the pride's territory and mate with the females. Each lion pride has a specific territory that it controls. The size of a territory can vary enormously, from 20 sq km to 400 sq km, depending mainly on the concentration of available prey. While young males are expelled from the pride by the age of three, females usually remain with the pride for their whole lives. Male lions do not look after the cubs in a pride and take no part in helping raising the young, but they do protect the whole pride against other males. Cubs are safe as long as their father is in charge of the pride. However, when a new male lion ousts the existing dominant male and takes over the pride, he normally kills any existing cubs. He does this because a female can have a litter only every two years if she raises her cubs to weaning. However, if she loses her cubs she comes into season within as little as four weeks. So it is to the male's advantage to ensure the females in the pride are available for procreation as soon as possible after he takes over, othewise he may in turn be displaced before producing his own cubs. Male lion siblings often stay together after being forced to leave the pride by the resident dominant males, usually when they reach 2½ to 3 years old. They will then live a nomadic life as young bachelors until old and strong enough to compete for a territory of their own, where they will have the benefit of working as a team in challenging a pride's resident male or males. 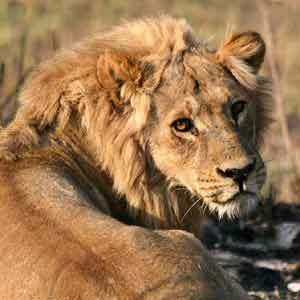 The lion has short, tawny hair, a paler underside and a long tail ending in a black tuft. The color of the lion's coat, which can vary from tan, orange-brown or even silvery gray to dark brown, is determined by the proportion of light hair to dark hair in the coat. Because adult male lions have manes, the lion is the only member of the cat family in which the males and females can be distinguished from each other by appearance. This of course does not apply to lion cubs, where baby males and females look the same. 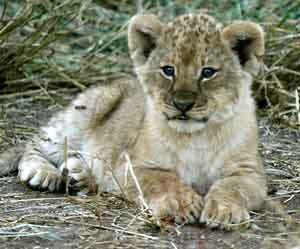 Baby lion cubs have wooly, grayish coats with white spots on the lower parts, mainly the tummy and legs. Their coat changes to the more tawny color typical of adults at about three months and the white spots gradually fade with age, although in some lions the spots remain on their stomachs for their entire life. Of all the cats, lions have the strongest forequarters, which is why a lion can deliver such a deadly blow with a front paw - hard enough to break a large antelope's back. The front paws are bigger than the hind paws. The paws are fitted with heavy, sharp claws, which are specially designed weapons that can be retracted when not in use, ensuring they remain protected and sharp. A lioness becomes sexually receptive for two to four days about once every two years, provided she raises her cubs to weaning. 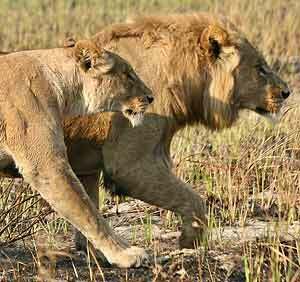 Mating between lions occurs about four times an hour over a period of one to four days. The female may turn her attention to one of the other pride males when the first one is worn out. See Lions Mating for pictures & video. Pride males do not compete or fight to mate with a sexually receptive lioness as she will often mate with all of a pride's males in turn as each loses interest in her, so there is no reason to compete for her favors. Females within the same pride will often have cubs at more or less the same time. This means that some females can go out to hunt while other mothers stay at home to care for the cubs. Cubs have the best chance of survival when a number of litters are born almost simutaneously as such cubs can virtually be raised in a "nursery". Once a mother introduces her cubs to the rest of the pride when they're about two months old, it's possible that they can be suckled by any lactating females (called allo-suckling) as pride females suckle one another's cubs, with no bias towards their own. Thus one lioness may be seen suckling cubs of obviously differents sizes and ages. As males play no part in raising the cubs, providing food and training to hunt is the responsibility of the mother. 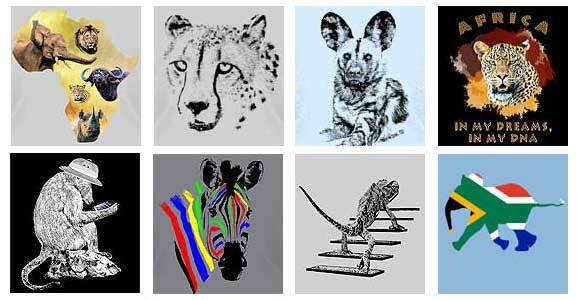 Litters of up to six baby lions (but usually one to four) are born at any time of year after a gestation of 110 days. The mother initially conceals her cubs in dense cover or in a cave, away from the rest of the pride. At birth baby lions weigh about 1kg (2.2lbs) and are completely helpless. Their eyes open after about 10 days and they can walk at 10 to 15 days and run at 25 to 30 days. The mother will only introduce them to the rest of the pride once they're one to two months old. Lion cubs are weaned at seven to nine months, but are unable to fend for themselves before they're 16 months old, although they start to eat meat at about three months. Cubs stay with their mothers for about two years, at which stage they're old enough to join the pride on hunting excursions. Lions are efficient predators that kill and feed on mammals like big and small antelope, wildebeest, zebras, and even larger mammals like giraffe and buffalo. To get within range of their prey, lions rely mainly on stalking and will seldom charge unless within 30 meters of the victim. When hunting larger animals, a lion usually attacks at an oblique angle before leaping and throwing one paw over the shoulder or rump and then using its weight and strength to pull down the quarry. Female lions do most of the hunting for the pride because the males, with their prominent manes and larger size, are more conspicuous and more easily spotted by potential prey. On group hunts, males will usually trail behind without taking part. However, once a prey is brought down, they soon arrive and force their way to the front of the line, eating their fill before allowing the females and cubs a turn. When more than one lion is at a kill, agression and noise are the norm. The more lions and the smaller the prey, the more intense the competition. Wild animals have to fight for a share of the spoils to survive. Males eat first, gorging themselves, and will on average eat 18kg (about 40lb) in one session, but can stuff themselves with nearly double that amount. Once they're done, it's the turn of the females to eat, with the cubs getting the leftovers. 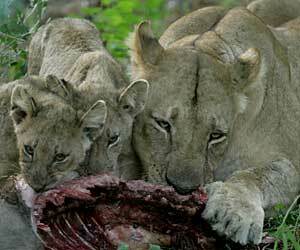 In times of food shortage, starvation is the major cause of lion cub deaths. Although this sounds cruel, it is better for the survival of the pride for a cub to starve than an adult female, which can not only hunt, but also breed again. that can be retracted when not in use, ensuring they remain protected and sharp. The average lifespan of a male lion is 12 to 16 years, and for a female it is 15 to 18 years. See also Lion Information for more on lions, including their average size and weight.